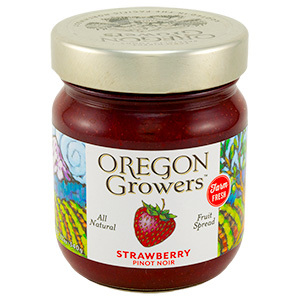 Oregon Growers’ Strawberry Pinot Noir Jam uses Oregon’s famous Totem Strawberries and combines them with pinot noir wine to create an earthy and rich flavor. The savory blend of juicy strawberries and pinot noir pairs well with the vanilla in the sugar cookie, and makes for a delicious treat. The best part of this simple recipe is it can be used year-round by using a different shape cutter for your cookies. The heart shaped cookies make the perfect Valentine’s Day dessert, or package them for an easy gift sure to please. Preheat the oven to 350 degrees. Line 3 baking sheets with parchment paper and grease with cooking spray. Beat the butter on medium speed in mixer using the paddle attachment for 1 minute. Add the oil and combine. Begin adding both sugars, the egg and vanilla. Continue to mix on medium until completely combined. Turn the mixer to low and add the flour, baking soda and salt. Remove the bowl from the mixer and place in the freezer for 20 minutes or the refrigerator for 1 hour. Divide the cookie dough in half. On a floured surface roll out the dough until it is 1/4” thick. Use the 2” heart shaped cookie cutter on the first half of the dough. Place those hearts on the baking sheet and set aside. Roll out the second half of dough until it is 1/4” thick. Use the 2” heart shaped cookie cutter on this rolled out dough. 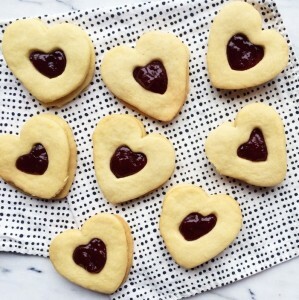 Then, use the ½” cookie cutter on the insides of the bigger hearts. Remove the small heart to create a hole. Place all cut out cookies on the baking sheet.